This big, well patrolled mountain offers a wide range of special interest clinics like Season warm up, women’s, men’s, kids, mogul, freestyle, snowboard, powder and Telemark as well private out of bounds tours. Now owned by the folks at Squaw Valley, you can ski at both mountains for the same price. Locals ski at Alpine Meadows because it is smaller, more intimate but with big terrain. It is also open for only a short period of time which means it is nice variety from the larger ski resorts in the neighborhood like Squaw Valley and Northstar at Tahoe. Alpine Meadows is located on the North West Lake Tahoe Shore. 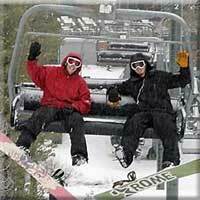 Alpine Meadows discount lift tickets are sometimes available. Two special surface lifts are available for Kids’ Camp participants, and other skiers can use uncrowded transport to the top: one high speed detachable six passenger chair, two express quads, three triple and five double chairs. Alpine Meadows is close to Squaw Valley, and mixes serious fun with easy going attitude to create the perfect ski or ride experience. This Lake Tahoe favorite resort is open from November to April... depending on snow. Alpine Meadows is a great day trip, and you'll be greeted by many of the locals who really love this place, along with the overall lack of crowds. People are really friendly at Alpine. A real locals mountain. Living up to its reputation for offering a great mountain at a great price, Alpine Meadows has been included in Skiing Magazine’s 2007 Resort Guide as one of the country’s best mountains, and Transworld Snowboarding’s 2007 Resort Guide as one of the top mountains for snow quality at a great price. For Alpine Meadows hotel reservations, we recommend you stay in Tahoe City, which will give you access to Alpine Meadows, Homewood, Squaw Valley and Northstar. For vacation condo reservations, we recommend anywhere along the north shore including Truckee, Olympic Village, or to the south Tahoma.